Auto Lighting Optimizer (ALO) is a feature found in all recent EOS models. It is in-camera processing that aims to improve the contrast of images and is especially useful for backlit or flash-lit subjects. By default, Auto Lighting Optimizer is not available in Manual and Bulb exposures as the cameras assume you want full control of the image. However, if you would like to make use of ALO, press the INFO button in the ALO settings and uncheck the option for “Disable during man expo”. This will allow you to then turn on ALO whichever shooting mode you are using. The EOS 5D Mark III features a Silent Touch Control pad on the quick command dial, found on the back of the camera. During movie shooting, this is used to adjust settings such as audio recording level and aperture without the risk of causing clicks to be recorded on the audio track. For adjusting the audio level live, it is very effective, however if you adjust the aperture, you should pay particular attention to the audio track afterwards as you may find the internal microphone has picked up the sound of the motor driving the aperture blades. To avoid this, use an external microphone that will not pick up the lens motor. The EOS 5D Mark III features a Rate button on the left of the rear LCD screen that has been designed to make it easier to find images when editing. In general, when shooting, you know when you have taken a good frame. However, if it is in a sequence of similar images, finding it again while editing can take a little time. By using the Rate button on the EOS 5D Mark III, you can add a 1-5 star EXIF compatible rating so that when you come to sorting your pictures out later, your best images are easier to find. Those you have tagged will be at the top, and while you don’t want to miss the action looking at the back of the camera rating images, a single press of the Rate button in playback gives a star rating that can be easily done in the downtime between the action. If you plan on using the in-camera multiple exposure capability in cameras such as the EOS 5D Mark III, you need to remember where exactly the image elements are in relation to each other. For example: overlaying the moon on a landscape. To make this easier, use the viewfinder grid and the focus points to provide a visual reference of where subjects are from previous images, relative to the current image you are creating. When recording HD movies directly to an external recorder through the HDMI port, your movies will have no audio included with them as the HDMI output does not include audio. If you wish to ensure your externally recorded movies have audio, make sure you use the headphone output on the EOS 5D Mark III to feed an audio line into your external recorder. This way your audio and video will be synced. If, in some moviemaking situations, you find that your longest lens is not quite powerful enough, there is a useful trick you can employ using External HDMI recording. 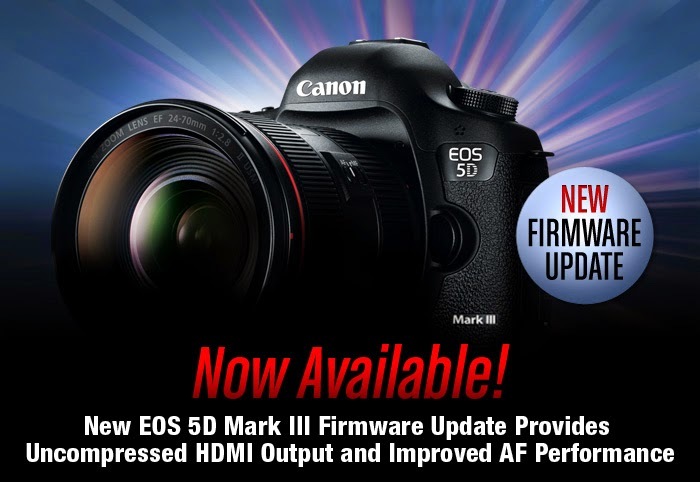 With firmware v1.2.1 and later on the EOS 5D Mark III, when recording full HD movies out of the HDMI port onto an external device, if you zoom the screen view on the rear LCD panel to either 5x or 10x magnification, the view will be sent out of the HDMI port provided you have LCD screen mirroring set to ON. This allows you to effectively record a 10x magnified view of your scene. While the quality is not perfect, it can help you achieve a shot you may otherwise be unable to achieve. With firmware versions 1.2.1 and later, it is possible to record full HD movies on an external recording device through the HDMI port. If you are shooting interviews or weddings, this is a very useful ability because it bypasses the 29min 59sec recording limit, so your recording time limit is only set by the external recording device you use. One of the most used custom functions on digital cameras is Back Button Focus, where either the AF-ON or the AE Lock (star) button is used to activate AF, rather than using the shutter button. This is especially useful when shooting subjects that are static and then move, or vice versa, as it saves you needing to switch between One Shot AF and AI Servo. However, while Back Button Focus is exceptionally useful when shooting static subjects, some people still like to have a focus confirmation light in the viewfinder. Using the custom controls, you can. In the Custom Controls menu, you can select to use the Depth of Field preview button to switch between One Shot and AI Servo focus. Simply activate this option and now, whichever focus mode you are in, pressing the Depth of Field Preview button and keeping it pressed, will immediately jump you to the other focus mode. By leaving the camera in AI Servo, you can jump to One Shot to get a focus confirmation light, or even a beep and then shoot in full confidence knowing that you have locked your focus. The EOS-1D X, EOS 5D Mark III and EOS 7D DSLRs all feature several different focusing modes beyond Single Point or All Points. These include Spot, Zone and AF Point Expansion. AF systems require a certain level of light to function and once the light levels fall, they can struggle to focus quickly or accurately. In these situations, you can use the assist beam from an EX-series Speedlite flashgun. If the camera still struggles to focus, instead of selecting Spot, Zone or AF Point Expansion, choose Single Point AF as your area selection method and then select the central point as this will have the best chance of achieving focus with the flashgun’s assist beam.